We are an award-winning Estate and Letting Agent covering Dorset and Hampshire. With offices in key locations, Canford Cliffs and Christchurch, we are fully equipped to help you move in and around the counties. Going the extra-mile is standard for us. We take great pride in saying that we are real people that will treat your property as if it were our own. Our heritage comes from four decades within the Estate Agency world, along with the CEO having bought, sold and invested in property for over 30 years. Our Sales and Lettings teams have both won awards and we have been mystery-shopped for the last three years but an outside, professional panel. On the back at this we have won Gold at the British Property Awards 2016 -2018. Quality property details designed and printed by an outside company to give high definition images and exceptional print quality. 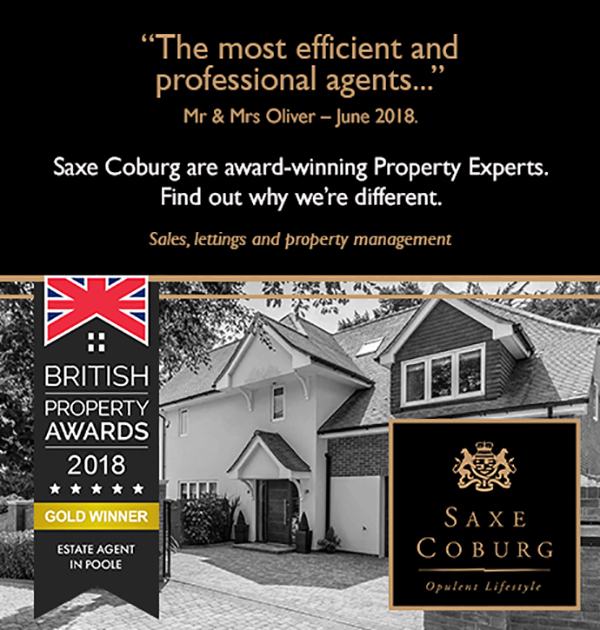 Whether you are buying or selling a property near the beachfront, town centre or the countryside, allow us to take the stress away and enjoy a smooth successful transaction from beginning to end with Saxe Coburg. The advantage of being an independent, niche agency is that we can deliver an exemplary personal service and we are not bound by a national head office to make quick, all-important decisions. Open Monday to Friday from 09.00 to 18.00 and 09.00 to 16.00 on Saturdays, we also conduct viewings outside usual opening hours on Sundays and Bank Holidays whenever our customers require it. We go the extra mile, because we can.